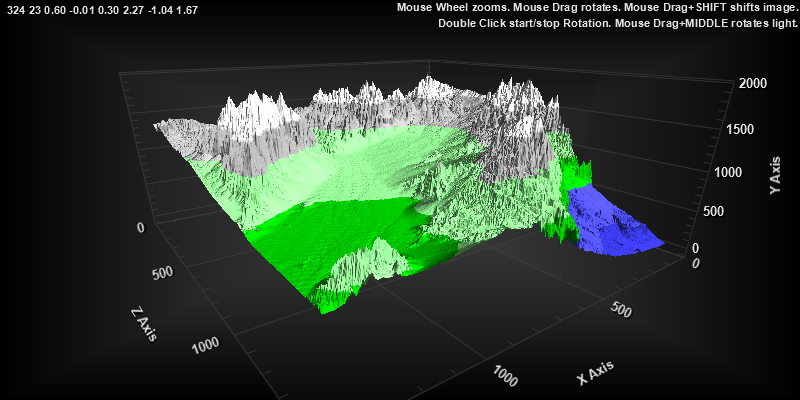 The 3D Scientific Graph Control is capable of producing a wide variety of charts. These include Surfaces (WireFrame, Solid, Shaded Solid, Contoured Solid, and Pixel), 3D Bar (WireFrame, Solid, and Shaded Solid), 3D Scatter (Points, Lines, Points + Lines, and Area Layers producing a Waterfall chart), and 3D Object (via a polygon data interface in WireFrame, Solid, and Shaded Solid styles). The property PolyMode is used to control which type of image you need to produce. All support rotation and viewing height zoom adjustment. There is also an automatic rotation feature which will animate the rotation of an image. Within the demo, see example 400 which shows how to create a simple 3D Chart. 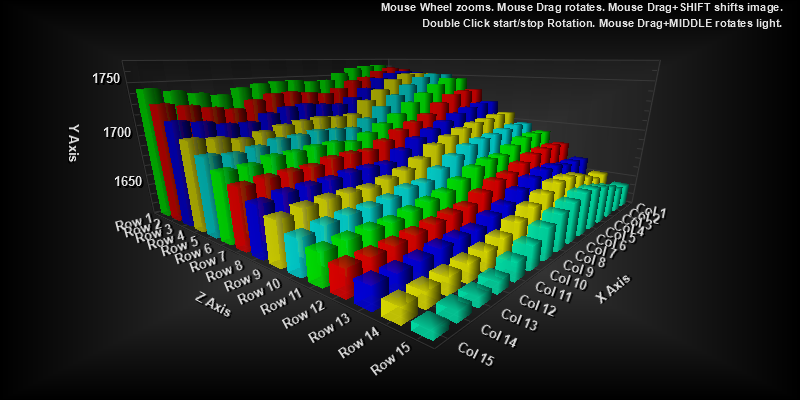 3D Surface charts are produced from XData, YData, and ZData. Generally, X-Data and Z-Data are equally spaced but this is not mandatory. Once you supply this data, the component will construct a list of polygons which will produce a surface plot of the data. The process of creating 3D charts is further discussed in Chapter 4 as well as in the included example code. Within the demo, see example 402. The 3D Bar chart is generally used to show categorized data along 2 axes. Where a 2D Bar chart places multiple subsets next to each other, the 3D Bar places multiple subsets at different z locations. Similar to the Graph component, the 3D Bar chart only needs YData. XData and ZData are not used in this mode. Subsets defines how many rows are along z axis and Points defines how many columns are along x axis. SubsetLabels and PointLabels are used to label rows and columns. SubsetColors is used to control colors of subset bars. Within the demo, see example 405. 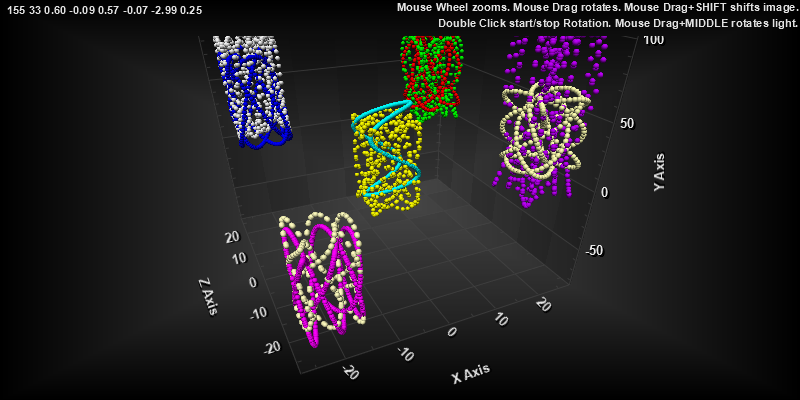 The 3D scatter chart is much like a 2D scatter chart with the addition of ZData. Each data point thus has its own XData, YData, and ZData coordinates. Possible plotting methods are points, lines, and points plus lines. Theres also an Area plotting method which will produce area layers along the z axis. This can be used to construct a Waterfall chart. Comparison Subsets are supported in this mode to allow for combining of plotting methods. See PlottingMethod, and PlottingMethodII, and ComparisonSubsets. Within the demo, see example 404. 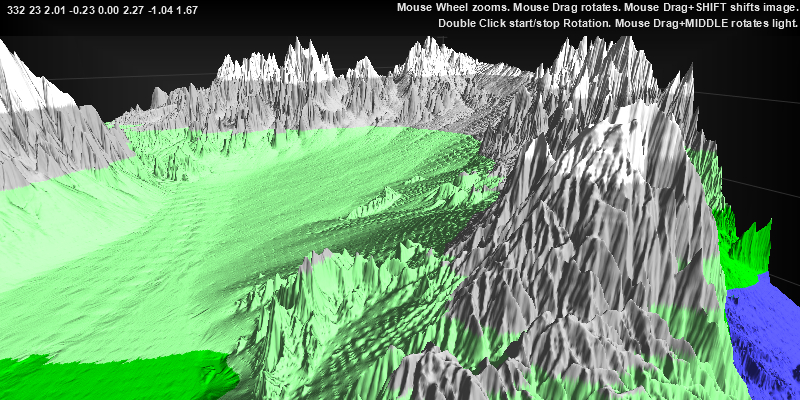 The 3D Polygon data interface (PEP_structPOLYDATA) allows the developer to supply their own list of polygons to be rendered. WireFrame, Solid, and Shaded Solid images can be produced from this data. Its important that polygon vertices are ordered properly. The polygon vertices must be ordered in a counter-clockwise order as viewed from outside of the object. This is only necessary for hidden line removal and shading purposes. If you are only producing a wireframe image, the ordering of vertices is not critical. More than one object can be placed into 3D space. Within the demo, see example 406. 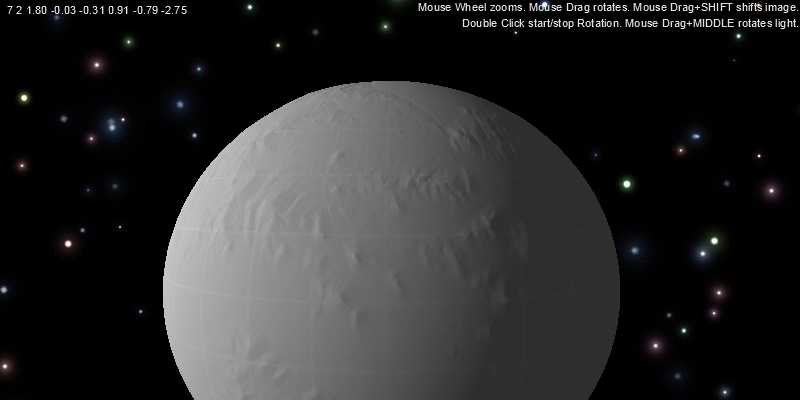 The 3D chart component can be rotated in several ways. Either by dragging the thumb-tags on the horizontal and vertical scrollbars, dragging anywhere inside chart if MouseDraggingX is enabled, and by invoking the auto-rotation feature by double-clicking or using the popup menu. See AutoRotation. The Plotting Method list will change based upon the PolyMode setting. You can also control the possible entries with properties such as AllowWireFrame and AllowSurface. This same control of plotting methods is also available for the other components. While the component is auto-rotating (AutoRotation), you can control the degree direction and increment between each image. See RotationIncrement. For non DirectX, when PlottingMethod is set to Surface with Shading, this feature controls whether the brightest polygons will be bright white or the brightest shade of color. See ShadingStyle. 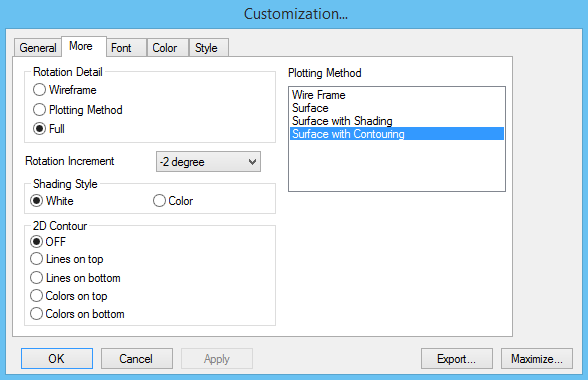 When PolyMode is set to SURFACEPOLYGONS, there is an option to place a 2D contour above or below the surface plot. This contour can be in the form of lines or colors. If a color contour is added, then a legend is also added unless explicitly disabled by the developer with ShowContourLegends set to False. See ShowContour. Within the demo, see example 401.